Caravan Guard will be attending the Motorhome & US RV Show in Shepton Mallet this weekend and are giving you the chance to win a durable Multi Tool kit. All you have to do is hook a duck with a red coin on the bottom. It’s a one in five chance but even the runners up will receive a spirit level keyring, it’s free to play and everyone wins a prize so you’d be ‘quackers’ not to have a go! 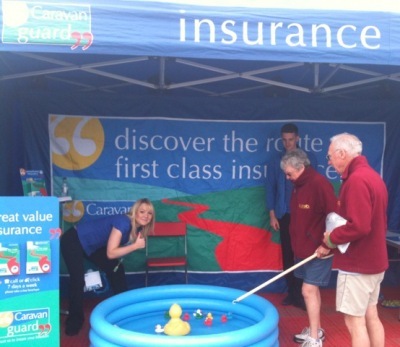 Our team will also be on hand to give insurance advice and answer any questions that you may have. Plus, we’re offering a special show discount of £10 off any new motorhome insurance quote requested at the show – just come see us on stand number D8 and we’ll arrange for an insurance adviser to call you at a convenient time for you. We’d also like to hear from any existing customers, whether you’ve got a question about your insurance or would like to tell us job well done, we’ll be there all weekend should you need us – and of course existing customers are more than welcome to enter our competition too! The show represents a great opportunity to view hundreds of UK, European and American built motorhomes both new and used offered by a wide selection of the UK’s largest motorhome dealerships. The show has over 120 different exhibitors with loads accessory stalls selling satellite dishes and reversing aids to outdoor leisure clothing. The £10 off is available on new motorhome policies only. Offer ends 31st October 2012. Minimum premiums apply. Discount subject to terms and conditions, cover level and underwriting criteria.